Gutiérrez has been told to repay $9,700 to the Treasury as a result of what was called "inadvertent" use of funds provided to his office for its operation, the Chicago Sun-Times reports. The Illinois Democrat had hired former chief of staff Doug Scofield to advise his office, resulting in questions as to whether Scofield was acting as official staff. "The OCE Board recommends that the Committee on Ethics further review the allegation, as there is substantial reason to believe that Representative Gutierrez used funds from his MRA for an impermissible purpose – to retain an individual to provide services to his congressional office that more closely resembled those provided by an employee or consultant, rather than a contractor – in violation of federal law and House rules," the Office of Congressional Ethics recommended. The investigation into Gutiérrez first began back in 2013. The congressman has long been close to Scofield and credited the advisor as a "partner" in his 2015 book Still Dreaming: My Journey. Gutiérrez announced last fall he will not seek reelection at the end of his current term but said at the time he was "not retiring." 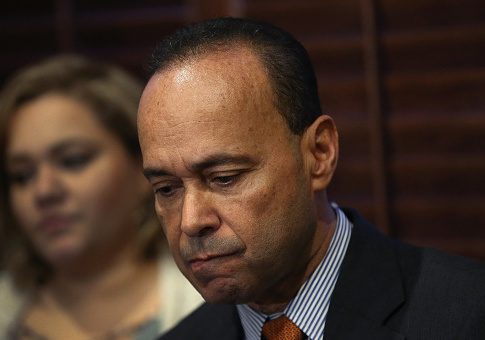 This entry was posted in Politics and tagged Ethics, Government Waste, Luis Gutierrez. Bookmark the permalink.